Friday’s executive order is mainly just a message, but it's a scary one. Donald Trump signing an executive order has now become a cultural trademark, with its own Twitter feeds and play-by-play. What the orders don’t share is any consistency. Some, like the immigration ban, lead to immediate (and tragic) impacts. Others commit the government to generally look around for regulations to trim, or to try to come up with something around Obamacare. The latter executive orders are signals, statements of intent that do little on their own but suggest the thrust of administration policy. That’s the proper context for Trump’s signing an executive order Friday on the Dodd-Frank financial reform law. Dodd-Frank won’t be repealed by executive fiat. But unlike some other policies, if the administration sees fit, Dodd-Frank can easily be effectively repealed by neglect. We haven’t seen the text yet, but Bloomberg suggests Trump will “order a sweeping review” of Dodd-Frank, with an emphasis on “removing regulatory burdens” caused by the changes to banking rules. In practice, this means that Trump will ask his Treasury Secretary and the national banking regulators—an alphabet soup of nearly a dozen agencies—to identify what rules can be changed in Dodd-Frank to relieve those alleged burdens. Since the majority of the rules have already been implemented, it would take a protracted process under the Administrative Procedures Act to nullify or peel back rules, involving years of proposals and public-comment periods and final decrees. Even then, the changes would have to fall in line with statutory demands under Dodd-Frank, and if they don’t, organizations can sue the government for failing to follow the law. That would extend the process even longer. Other rules—like ones requiring banks to hold more capital—are conducted under international auspices, and trade-agreement violations could come into play if the United States offers unequal treatment among domestic and foreign banks. In other words, if this executive order were the only change to Dodd-Frank contemplated, we should expect an actual impact sometime around the second term of the Gillibrand administration. Even a senior administration official admitted to Reuters that the executive order “is not an attempt to undo Dodd-Frank,” because that would be impossible under our system. However, Trump will have some immediate opportunities. Friday morning, the Senate voted to rescind Dodd-Frank Section 1504, an anti-corruption rule that forces the disclosure of oil- and gas-company payments to foreign governments. Because that rule wasn’t finalized before a deadline under the Congressional Review Act, Congress could wipe it out through a simple majority vote. A handful of other late-in-the-game Dodd-Frank rules could be eliminated in this fashion. 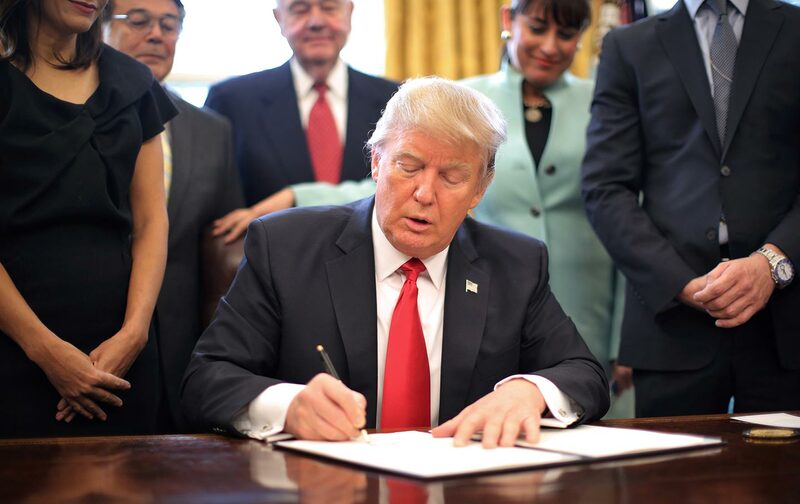 A presidential memorandum Trump will sign Friday halts the implementation of the Department of Labor’s fiduciary rule, which would force certain financial advisers to operate in the best interest of their clients (or as a “fiduciary”). That rule was finalized before the deadline, but the effective date begins in April. Trump’s Labor Department will still need to dismantle the rule, but they can stop implementation, giving brokers a free hand. A new report released by Senator Elizabeth Warren shows the lavish kickbacks advisers get from their affiliates (like cruises, jewelry, and resort vacations) in exchange for sticking Americans with high-cost annuities and other unnecessary products. The years-long fight over the fiduciary rule has been almost comical. The financial industry argues that the rule will deprive customers of needed expertise and advice, essentially saying that advisers cannot do their jobs unless they’re allowed to rip people off. Some brokers claimed they would comply with the spirit of the fiduciary rule anyway, regardless of the Trump administration’s actions. But there would be no sanction if they slipped from that promise, which suggests the real impact of Trump’s executive orders: They signal to banking regulators to essentially stop enforcing. This can be done simply and elegantly, without congressional negotiations or rule-making procedures. It includes firing Richard Cordray, director of the Consumer Financial Protection Bureau, and installing a replacement who would shift the agency away from doing anything to, well, protect consumers. Very few normal people deeply monitor the level of regulatory scrutiny, so this return to laissez-faire will pass virtually unnoticed. That certainly appears to be the prerogative of Gary Cohn, the former Goldman Sachs president now serving as director of the National Economic Council. In an interview with The Wall Street Journal, Cohn sounded like a parody of a bank tycoon, railing against virtually everything that’s ever been done to restrict Wall Street. “Americans are going to have better choices and better products because we’re not going to burden the banks with literally hundreds of billions of dollars of regulatory costs every year,” said Cohn, assuming that banks would generously transfer those savings to the public rather than to executives and shareholders. The goal “has nothing to do with Goldman Sachs” or other banks, Cohn added; “It has to do with being a player in a global market where we should, could and will have a dominant position as long as we don’t regulate ourselves out of that.” That dominant position would benefit, um, Goldman Sachs. Cohn continued by simultaneously saying “we have the best, most highly capitalized banks in the world” and “the most highly regulated, overburdened banks in the world.” In fact, on Fox Business Friday, Cohn lamented that banks need to “hoard capital” rather than lending it out, suggesting that Cohn wants to relax the very capital standards he touted in the same breath. While regulators play card games instead of scrutinizing big banks, Congress can certainly try to finish off Dodd-Frank legislatively. Paul Ryan said at last week’s retreat in Philadelphia that this would be a “top priority,” but the GOP would need to bust a Senate filibuster for most changes. However, some Republicans are devising a scheme to use the budget-reconciliation process to overturn Dodd-Frank, by identifying parts of the law that have a budgetary impact. That would only require a majority vote in the Senate, and it could work for pieces that cost money like orderly-liquidation authority, the process by which regulators can unwind failing institutions. But combining Dodd-Frank overhauls with the expected reconciliation focus on tax reform could get extremely messy. Because Dodd-Frank didn’t transform the system as a whole, all of the sins that led to the financial crisis can come crashing back. The problems may not show up in exactly the same form—maybe it’s corporate loans instead of mortgages—but they can certainly show up, because we still have giant banks relying on short-term funding and tight interconnections with other institutions. Absent active regulatory work, that can go south quickly. And when it does, liberals will have to bust out the overhaul blueprints that can actually prevent this from happening again.